The normally calm grounds of the Menzies School of Health Research took on a carnival atmosphere on Friday (March 16) when journalist and five-time Logie winner Ray Martin launched a new hearing information service. Administrator Ted Egan gave a speech of welcome, Aboriginal dancers enacted the rituals of slaying a buffalo and hunting for mud crabs, while children from the adjacent hospital and primary schools in the area were entertained by the team from Captain Starlight. The celebrations were part of Menzies’ Family Fun Day, designed for children and their parents to enjoy themselves, at the same time driving home the message of the importance of health in Indigenous communities. In launching the internet program EarInfoNet, Mr Martin said he had been astounded to discover that two out of three young Aboriginal children suffered from some form of ear damage and that the Northern Territory had the highest rate of ear disease in the world. He said that fixing Aboriginal health was a complex problem, and that if it had been easy it would have been fixed long ago. However, health standards were being lifted, and the EarInfoNet program was part of the solution to the problem of hearing damage. Under the EarInfoNet program, doctors, researchers, parents, nurses and anyone involved with Indigenous health can access information about ear problems through a special website. This was a big improvement on the days when information about ear damage and possible remedies was not available, or simply not accessible, Mr Martin said. ‘The website offers high quality, up-to-date information,’ he said. The EarInfoNet website is compiled by the Menzies School of Health Research in association with the School of Indigenous Studies at Edith Cowan University in Western Australian and the Cooperative Research Centre for Aboriginal Health. The major sponsor of EarInfoNet is Melbourne businessman Richard Pratt, who promised $1 million to help fix Indigenous health problems. 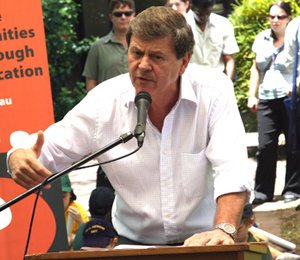 The donation came after Mr Pratt heard an impassioned speech from Ray Martin about the need for private intervention to help stop the worsening situation of Aboriginal health. 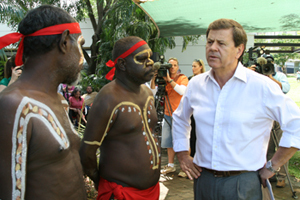 Mr Martin had told his audience that governments were falling behind in their responsibilities to fund Aboriginal health programs, and that private citizens could play their part. For complete information log on to www.earinfonet.org.au.